Google launched their Featured Snippets over two years ago but today many search engine marketers still see them as a novelty. These programmed organic results listed above the #1 ranking position contain an extracted answer, display title, and URL. Sometimes they also have an image, bulleted list, or simplistic table. They mean you’re ranking zero in SEO because they’re in front of the traditional organic results, but they’re also the same URL that ranks #1 so you get two listings for a single result on a single page. They’re quite prevalent, being found in 2 – 11% of SEO keywords tracked. They’ve doubled in prevalence in a single year and by as much as 5x since they were launched. Clearly, they’re no short-term, small-scale entity. They typically boost your CTR. Since the early days of search there’s always been a problem creating algorithms that can keep up with all the content that’s found online. Google first attempted to “fix” this by creating their Knowledge Graph, which was completely based on human-curated data, but this is still faced with the limits of human curation. Their answer to this was to take the trillions of pages in their index and use them to generate real-time answers. This content is deeply parsed for relevance. Snippets require a bit different, broader approach to keyword research. There are two things you need to know here. First, you must rank organically on the first page of the SERPs. This doesn’t mean you have to be in the #1 position, but that doesn’t hurt since this is where 1/3 (about 30%) of snippets come from, but the rest come from positions 2 – 5. Second, your content must effectively target Google’s question. This means you’re effectively in control here. One important tip as you create your content is brevity. If nothing else, at least summarize your answers somewhere near the top of your page then follow what Journalists call an “inverted pyramid” structure. What and implied-what questions are effective to ask, especially in defining industry terms and offering specialized knowledge that isn’t found in the dictionary. There are also dictionary cards that are driven by human-curated data that isn’t organic. This is why you must focus on uncommon terms and phrases when you’re trying to create snippets. Why and how questions are good because they’re not easily answered with factoids. They require some in-depth explanation instead. These are great because they serve as summaries for longer answers that will attract click throughs to your website. 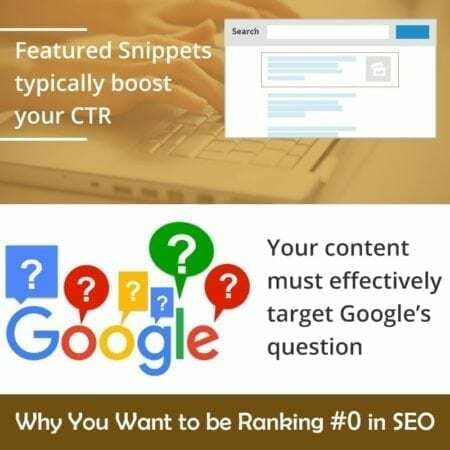 Other related questions are often labeled by Google as “People Also Asked.” While these aren’t as dominant as snippets they’re more prevalent – occurring in about 17% of searches. With your question in mind you’ll want to decide which of your pages is best suited for answering it. You’ll also need to know what part of your web page does this. Sometimes you may have to rewrite the page for this to work best for you. Think about what Google stands to gain from this type of SEO. Many people believe this is part of their shift towards adapting to our growing use of mobile and alternative display formats. These formats require succinct answers – something not found in traditional SERPs. Keeping up with all this is challenging at best. Fortunately, the Affordable SEO Company is here to help you with all these things. Reach out and enlist their help today.